NUI is offering for competition on a pilot basis a range of new grants, of a maximum value of €5,000, to allow Early Career Academics to engage in international conference organisation, participation and networking in NUI institutions, in institutions outside of Ireland or in the NUI building on Merrion Square in Dublin. Grants are offered under two streams. Applications for all streams are welcomed from all disciplines and interdisciplinary/multi-disciplinary proposals are particularly encouraged. An applicant may apply for either Stream 1 or Stream 2, but not both. Applications are invited for grants of up to €2,000, to support the development of connections, networks and collaborations with named institutions both inside and outside of Ireland, leading to a written proposal for a conference or symposium in an NUI institution. Applications are invited for grants of between €2,000-€5,000 to lead the organisation and management of an international conference/symposium in the NUI building on Merrion Square (use of NUI facilities included) or in an NUI constituent university or Recognised College. Allocated NUI funding will be transferred to a designated financial cost-centre within the recipient’s constituent university/Recognised College school, department or research institute. Stream 1 and Stream 2 grant recipients will be required to complete their planned activities and submit a report to NUI by 30th June 2020. The competition for the NUI Grant Scheme for Early Career Academics has now closed for applications and will re-open later in 2019 for the next round of applications. For more information download the NUI Grant Scheme for Early Career Academics Information Sheet, Application Form and Regulations below but please note that this information pertains to the 2018-2019 competition and is subject to change in future competitions. In 2019, one NUI Post-Doctoral Fellowship in the Sciences will be offered to NUI graduates in all branches of the Sciences valued at €80,000 (€40,000 per year for two years). In addition, NUI offers a small stipend for travel and subsistence and laboratory costs. The deadline for receipt of applications is Friday, 26th April 2019. The NUI Post-Doctoral Fellowships are funded by a special NUI Fund. The main purpose of these Fellowships is to encourage and support doctoral graduates of proven academic excellence to advance their scholarly research. It is expected that the research undertaken as part of the Fellowship will result in a substantial contribution to knowledge, worthy of publication, and contribute to the learning culture in the constituent institutions. The NUI Post-Doctoral Fellowship in the Sciences will be offered again for competition in 2019. Dr Christopher Broderick, 2017 recipient of the NUI Post-Doctoral Fellowship in the Sciences. 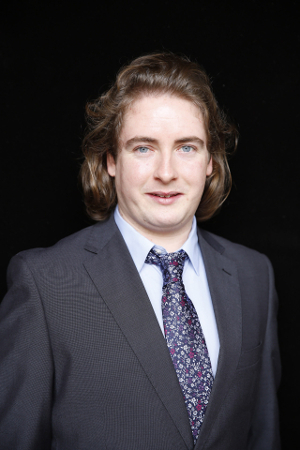 Dr Christopher Broderick (pictured) was the 2017 NUI Post-Doctoral Fellow in the Sciences and is undertaking his Fellowship at the Department of Physics and the Tyndall National Institute at University College Cork. His research project is entitled "Lighting the way for silicon photonics: theory and computational design of emerging group-IV semiconductor alloys". "Following the completion of my B.Sc. at University College Cork in 2010, I was awarded an EMBARK postgraduate scholarship by the Irish Research Council to undertake a PhD in theoretical/computational condensed matter physics at the Department of Physics at UCC, where I worked in the Photonics Theory Group under the supervision of Prof Eoin O’Reilly. My doctoral research focused on developing the theory of the electronic and optical properties of so-called “dilute bismide” semiconductor alloys. For my work on this topic I was a joint-first prize recipient of the BOC Gases Postgradute Bursary in 2013. I obtained my PhD in physics at UCC in 2018 and have since held postdoctoral research positions with the Photonics Group at the University of Bristol, U.K. (where I remain an Honorary Research Associate, in recognition of my ongoing strong links to the Institute) and more recently with the Photonics Theory Group at UCC. My recent research has centred on developing theoretical and computational models to develop the understanding of the properties and performance of novel materials and nanostructures for applications in next-generation photonic and photovoltaic devices." "I applied for the NUI Post-Doctoral Fellowship in the Sciences firstly in order obtain support for what I believe to be necessary and timely fundamental research on an exciting and technologically relevant topic, and secondly in order to allow me to pursue this research and related ideas independently: to establish my research independence, but to do so within a focused and interdisciplinary environment while tackling an important open problem in my field. I envisage that the Fellowship will play a defining role in my development at this crucial early stage of my career, by providing me with the freedom to establish and maintain my own research direction and network of national and international collaborators". The Fulbright Commission and the National University of Ireland are delighted to offer a new post-doctoral level scholar award for early career researchers to enable them to complete post-doctoral or professional research or lecturing in the United States for a period ranging from a minimum of three months to a maximum of 12 months. Applicants must be NUI graduates and holders of either (i) a PhD or (ii) a Post-Doctoral Fellowship awarded in a constituent university (i.e. UCD, UCC, NUI Galway, Maynooth University) or other NUI member institution no earlier than 3 years previously, i.e. 2014. The Fulbright Awards Competition will re-open for applications in August 2019. For more information, take a look at the list of Awards Dates and Deadlines. 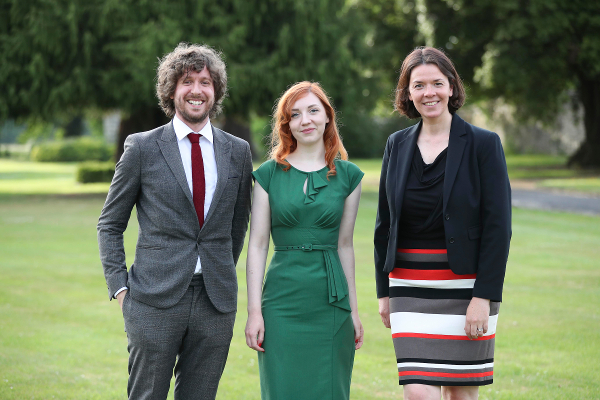 L-R: 2018-2019 Fulbright-NUI Scholar Award recipients Dr Cian O’Leary, RCSI and Dr Laura Lovejoy, UCC with Patricia Maguire, Head of Academic Services and Registry, NUI at the 2018 Fulbright Awards Ceremony in the U.S. Ambassador’s Residence, Deerpark. Dr Laura Lovejoy, a graduate of UCC and UCD, will undertake her NUI-Fulbright award at New York University. Dr Cian O'Leary, a graduate of RCSI and UCC, will undertake his NUI-Fulbright award at University of California, San Diego. 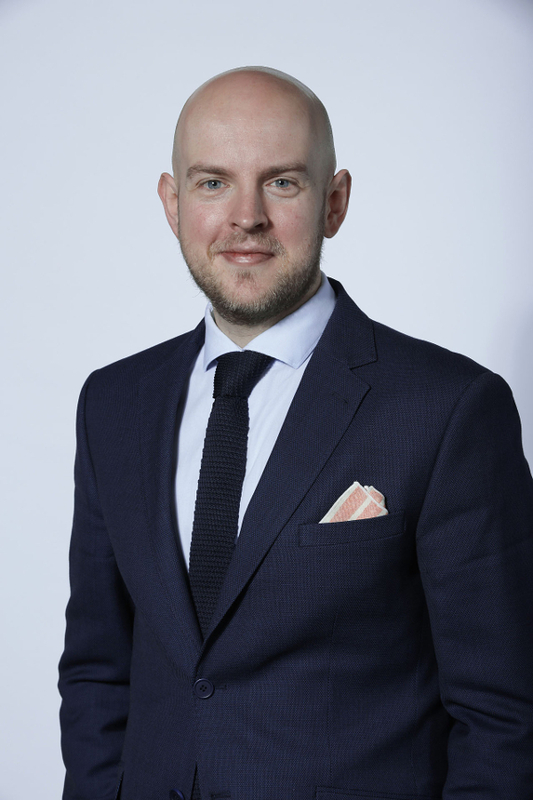 Dr Cian O’Leary is a Pharmaceutics Lecturer in the School of Pharmacy and a Principal Investigator in the Tissue Engineering Research Group at the Royal College of Surgeons in Ireland. As a Fulbright-NUI Scholar in the Dept. of Bioengineering at University of California, San Diego, he will undertake research to develop tissue-engineered in vitro models of breast cancer metastasis with the objective to address critical bottlenecks in the discovery of novel anticancer therapeutics. In 2018, one NUI Post-Doctoral Fellowship in the Humanities was offered to NUI graduates in all branches of the Humanities at a value of €80,000 (€40,000 a year for two years). The competition is now closed for applications. The NUI Post-Doctoral Fellowship in the Humanities will be offered again in the 2020 NUI Awards competition. 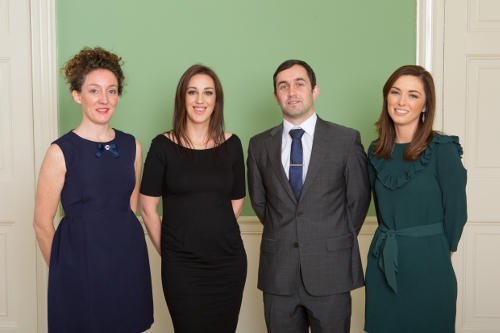 L-R: Dr Deirdre Ní Chonghaile and Dr Niamh Wycherley, recipients of the 2016 NUI Post-Doctoral Fellowships in Irish and Celtic Studies; Dr Brian Hughes and Dr Bronagh McShane, recipients of the 2016 NUI Post-Doctoral Fellowships in Humanities. The NUI Post-Doctoral Fellowships are funded by a special NUI Fund. The main purpose of these Fellowships is to encourage and support doctoral graduates of proven academic excellence to advance their scholarly research. It is expected that the research undertaken will result in a substantial contribution to knowledge, worthy of publication, and contribute to the learning culture in the constituent institutions. Dr Kieran Fitzpatrick, 2018 recipient of the NUI Post-Doctoral Fellowship in the Humanities. "In 2011 I completed a BA in English Literature and History at the University of Limerick. I went on to study for an MA in History (2011-2012) at NUI Galway. On the recommendation of my mentors within the department, I was advised to consider an academic career. After taking a year away from academic pursuits, I was offered two doctoral scholarships, one from the Government of Ireland at Trinity College Dublin and the other from the Wellcome Trust at St John’s College, Oxford. I accepted the latter and spent three years at St John’s (2013-2016), passing my Viva with minor corrections in March 2017. I subsequently left academia for six months and worked as a fundraising manager at Dublin City University, before returning to St John’s in October 2017 as a post-doctoral research assistant to a project focused on the History of Dyslexia. My fellowship will be based at NUI Galway’s Moore Institute, and will involve a detailed examination of the personal archive of Peter Johnstone Freyer (1851-1921). Freyer was one of the pre-eminent surgeons in Britain and Ireland at the turn of the 20th century, specialising in the removal of the prostate. Having been born in Connemara in September 1851, he attended Queen’s College Galway before entering the Indian Medical Service, the medical wing of the British Government in India, in 1872. In 1895 he left the Service and established a private practice in London’s Harley Street where, over the next twenty-five years, he treated and befriended some of the most powerful men and women in British politics and commerce. On his death in 1921, he left behind an enormous trove of personal material, including diaries, casebooks, correspondence and photographs, which remained in his family’s possession until 2001, when it was deposited at NUI Galway. My investigations of the material are the first by a professional historian, and hope to reconstruct the moral and ethical climate of surgery in an age of tumultuous political and technological change in medicine. My reasons for applying to the Fellowship programme were two-fold. Firstly, I greatly enjoyed my time at NUI Galway in 2011-12, and ever since have viewed Galway as the city in which I would like establish my life and career in the long-term. Secondly, I worked with the Freyer archive as a doctoral researcher between 2013 and 2016, and am passionate about using its contents to make original contributions to what we know about historical changes in the moral and ethical underpinnings of medical science. I am certain that the Fellowship will provide me with a suitable springboard into an established academic career, either in history or medical ethics. If, by the end of the Fellowship, I can point to two journal articles published, a monograph accepted by a major academic publisher, and a series of collaborations established with the medical school at NUI Galway that focus on engaging the public using the Freyer archive, my time spent at the Moore Institute will have been a success." The NUI Dr Garret FitzGerald Post-Doctoral Fellowship in the Social Sciences, established to honour the memory of the late Chancellor of the National University of Ireland, is used to provide research support for the NUI Education and Society Committee. This Fellowship is based in the NUI building on Merrion Square, Dublin 2 and will be offered for competition again in 2020. 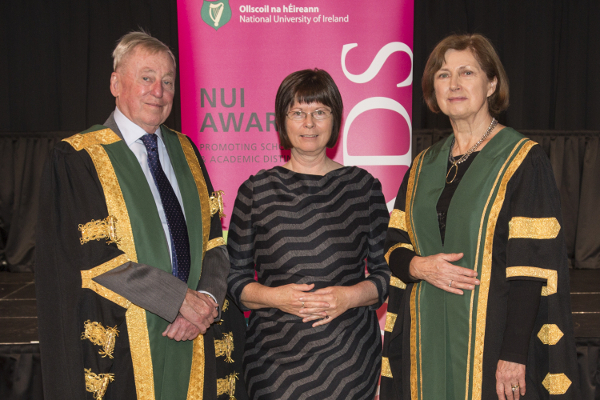 (L-R): Dr Maurice Manning, NUI Chancellor; Dr Ann Averill, 2018 NUI Dr Garret FitzGerald Fellow; Dr Attracta Halpin, NUI Registrar, pictured at the 2018 NUI Awards Ceremony. Dr Ann Averill is the recipient of the 2018 NUI Dr Garret FitzGerald Post-Doctoral Fellowship in the Social Sciences. Dr Averill undertook the BA in Adult Learning (part-time) at All Hallows College, Dublin during which she combined her studies with family and home duties as well as working five days a week, and graduated with 1st Class Honours in 2012. She progressed to University College Dublin where she undertook a Master’s in Social Science – Global Migration and Cultural Differences, and graduated with 1st Class Honours in 2014. She was awarded the Mary Kelly Bursary in recognition of the high standard of her dissertation, and remained at UCD where she commenced a PhD in Sociology. Her research focus was on the sociology of nationalism, with particular emphasis on contemporary Irish nationalism. The title of her research thesis is: “Irish Nationalism and Globalised Society: A study of the generation born in Ireland between 1976 and 1986”. This was a qualitative study examining Irish nationalism through the conceptual lenses of emotions and generational change. Ann completed her PhD in September 2018. Ann’s post-doctoral research will examine “The Irish University in the 21st century”, based at the NUI building on Merrion Square from February 2018. This study will enquire into the public understanding of the outcomes and value of a university education, in the context of expanding opportunities for post-second level education in Ireland. Cuireadh an Chomhaltacht Iardhochtúireachta seo, maoinithe ag Ciste Adam Boyd Simpson agus Eleanor Boyd, ar fáil do chomórtas i measc céimithe OÉ in 2016. Is é €80,000 an luach a bhí ar an gComhaltacht (€40,000 in aghaidh na bliana ar feadh dhá bhliain). Is é príomhchuspóir na Comhaltachta seo ná chun spreagadh agus tacaíocht a thabhairt d’iarrthóir iardhochtúireachta ar shárchaighdeán acadúil a dtaighde scolártha a chur chun cinn i réimse an Léinn Éireannaigh agus Cheiltigh. Beifear ag súil gurb é toradh an taighde ná go gcuirfear go mór leis an eolas agus gur fiú é a fhoilsiú agus go gcuirfear leis an gcultúr foghlama sna comh-institiúidí. This Post-Doctoral Fellowship, funded by the Adam Boyd Simpson and the Eleanor Boyd Fund, was offered for competition amongst NUI graduates in 2016. The value of the Fellowship was €80,000 (€40,000 a year for two years). The main purpose of this Fellowship is to encourage and support a post-doctoral graduate of proven academic excellence to advance their scholarly research in the area of Irish / Celtic Studies. It is expected that the research undertaken will result in a substantial contribution to knowledge, worthy of publication, and contribute to the learning culture in the constituent institutions.